Photo courtesy of Kevin Biernacki Mid-air badassery along the coastline. 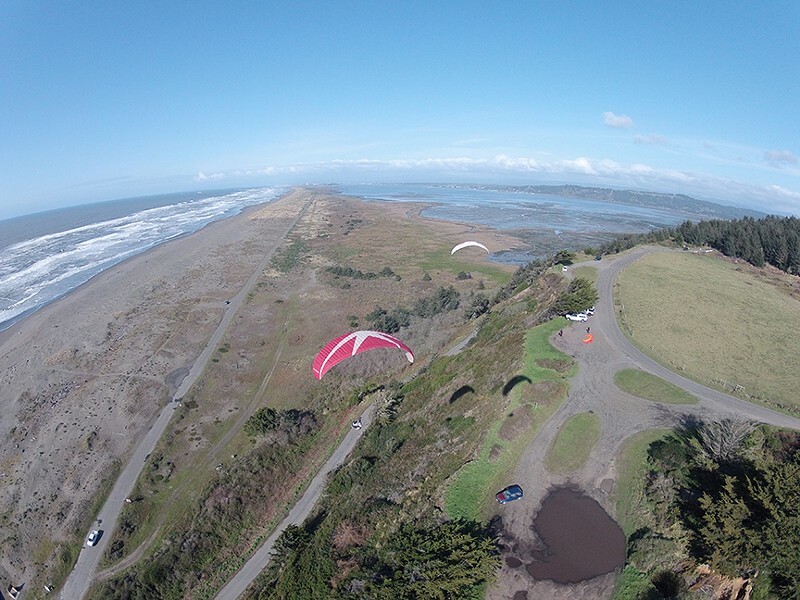 Photo courtesy of Kevin Biernacki Paragliding over Table Bluff. On a blustery, gray Sunday afternoon, a cluster of trucks parked at the Table Bluff overlook. Undaunted by the chilly wind (in fact, cheered by it), several people hoisted awkwardly sized backpacks to the end of the bluff. From these packs, they unfurled yards of ripstop material and strands of Kevlar. They adjusted their gear and checked the winds. Then, one by one, they jumped off the cliff. 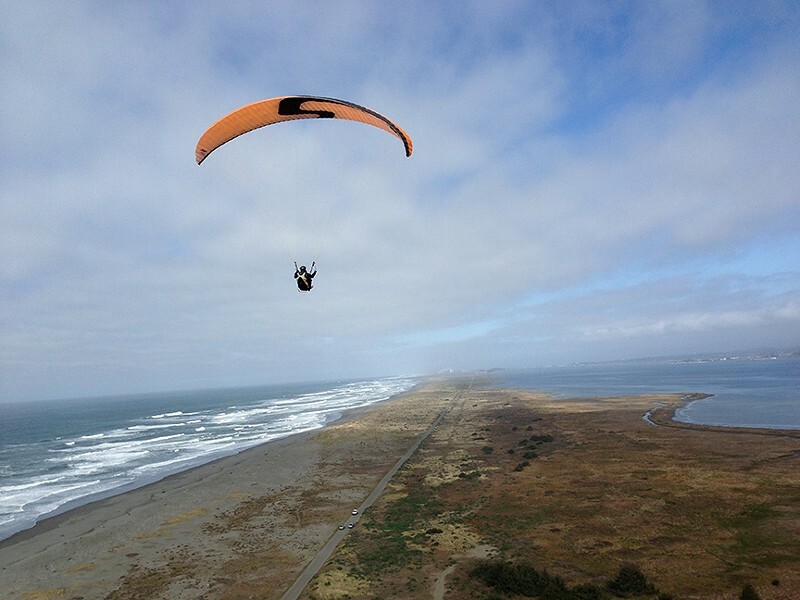 For the small, tight-knit tribe of paragliding and hang gliding pilots in Humboldt County, Table Bluff is a prime flying spot. Its high cliffs face northwest, and as those northwesterly winds hit the cliffs, they are forced up, creating an updraft that is perfect for taking flight. If conditions are good, pilots can fly from 9 a.m. to dark at Table Bluff. 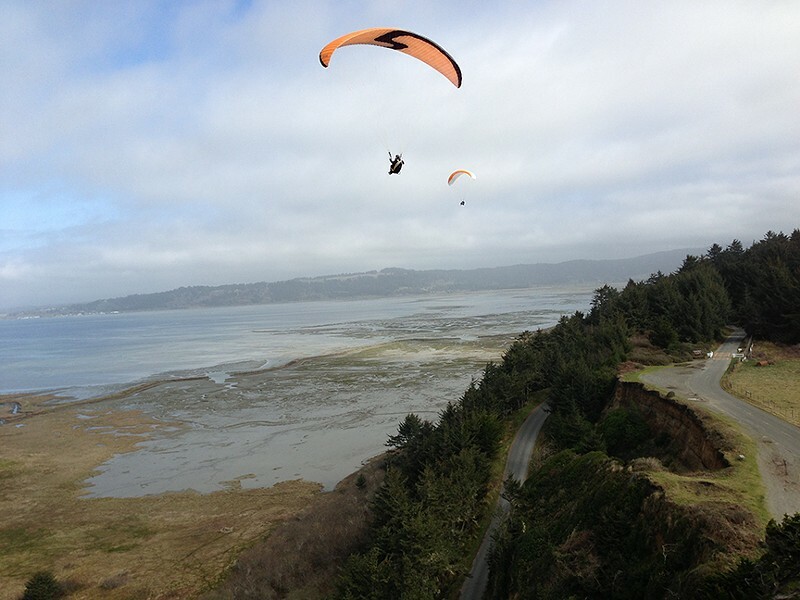 Experienced pilots take off from the bluff and ride the winds along the coastline. If they're lucky, they can catch a ride on a "thermal lift," a pocket of warm air, to higher altitudes. Steve "Montana" Nix, a regular pilot at Table Bluff, especially loves the thermals along the coastal mudflats near Hookton Slough. "When you smell sulfur," he said, "you know you're about to have a good ride. If I can catch a thermal on the muds on the bay, that's where I like to be, flying with the birds." For those of you who have never heard of paragliding, let me break it down for you. When most people imagine paragliding, what they are really visualizing is hang gliding, which involves flying a delta-shaped "wing" with a metal frame. The pilot is horizontally harnessed during flight, making for fast, stable flying. 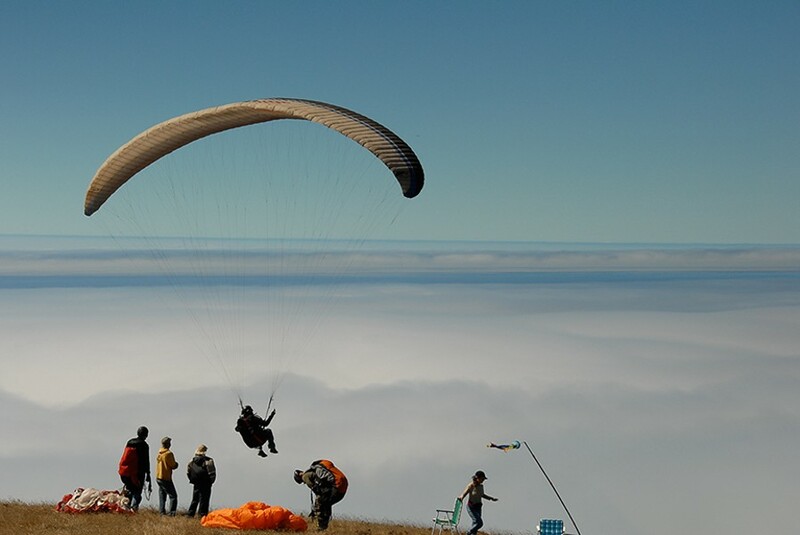 Paragliding involves a parachute-like wing, only longer and narrower. The wings are typically about 4 feet by 15 feet. The pilot sits upright under the wing in a harness and steers with controls at shoulder height. 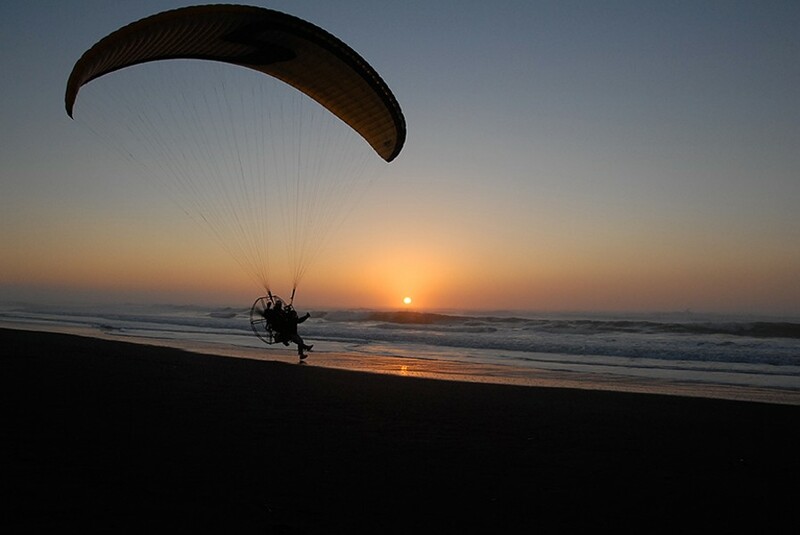 Because paragliding wings are lightweight, they are easy to travel with and set up. 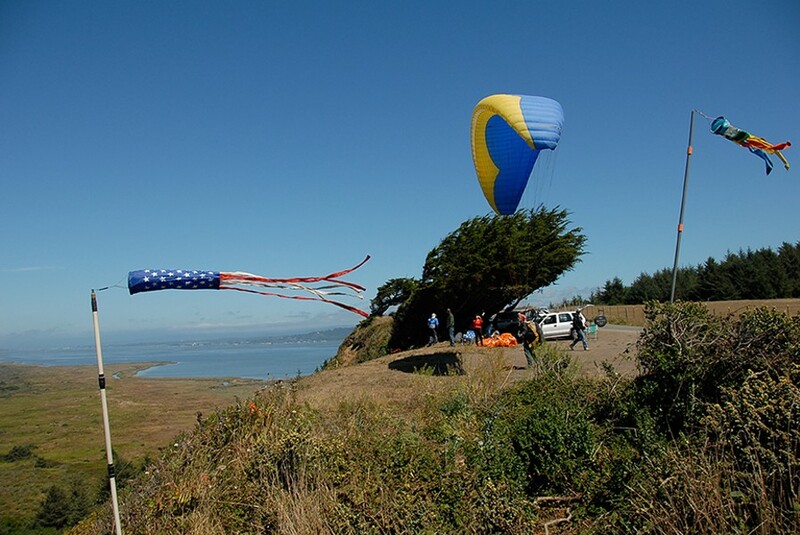 Paragliding is relatively new to the United States, but it's already popular in Europe, according to Kevin Biernacki, an experienced pilot and instructor. Intrigued? Biernacki travels the country and world teaching people to paraglide, but he's based in Loleta. His students, typically experienced outdoors-people looking to try something new, range in age from 18 to 75, and many are women. Students can become proficient in the sport in two to three weeks if they practice daily. If they are weekend-warrior types, it takes closer to two to three months for them to feel comfortable in the air. Biernacki said the ideal time to start learning to fly is in the spring, in order to get proficient by the summer. "In the winter," he said, "the winds are more southern with cold fronts," which can be challenging. But Montana described winter conditions as some of his favorite: "Cold is good for flying. I try to get out most every weekend. I can get in about 10 flights on a good day." During the first lesson, students learn about their equipment and start "kiting," or handling the wing from the ground. This "ground school" is the most time-consuming aspect of the learning process, but once a student feels comfortable steering the wing from the ground, actually getting off of the ground is simple. As Biernacki remarked, "A garbage can will fly once it's in the air." A student's first flight is usually done in tandem with the instructor. When it's time to fly solo, students take a radio up and remain in constant contact with the instructor. Biernacki said, "It's surprisingly less eventful than people imagine. It's not as dramatic as jumping out of an airplane. It's more like flying like a bird." Don Andrews, one of the pilots on the bluff, added, "The most important thing is to just relax and feel the glide." The pilots eagerly regaled me with stories of their first paragliding adventures and their favorite launch sites in the area. They are keenly aware of the ever-changing weather conditions, gauging them with sophisticated instruments and their own instincts. If you're looking for a new sport this winter, they would be happy to share the wind with you. DO NOT try to teach yourself to paraglide. While several of the pilots I met learned to fly through trial and error, none of them recommend that strategy. 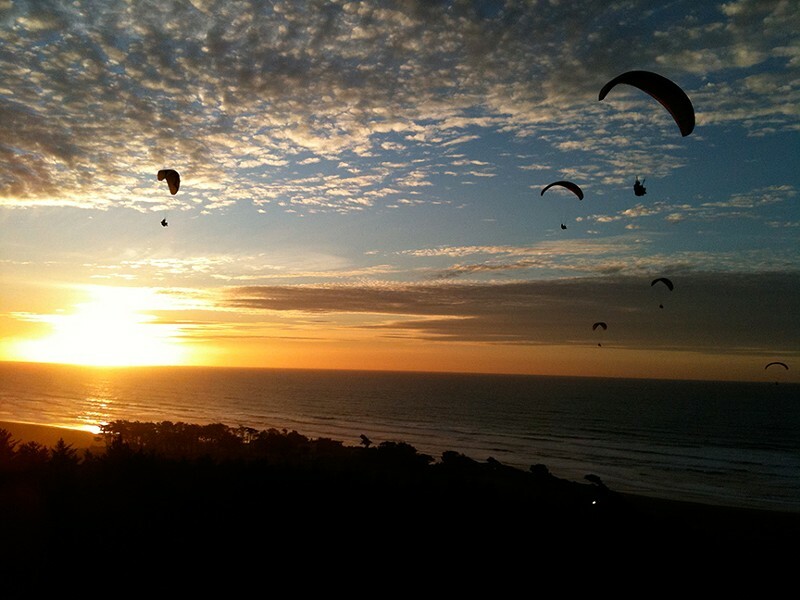 Like any high-risk sport, paragliding is made safer with quality instruction and keen safety awareness. As pilot Leon Dakusa adds, "It's just like driving a car. You gotta check the brakes, obey the rules and know your surroundings." Kevin Biernacki is the only local instructor, and you can contact him at upperlimits@hotmail.com. His lesson packages start at $1,600 for roughly 15 days of instruction. More advanced courses are available in acrobatics or flying with a boat tow-in. Choose your own adventure, badass.